The body of the universe consists of the 12 Rashis, which can be roughly translated as Ã¢â‚¬Å“astrological signs.Ã¢â‚¬Â Each Rashi represents a part of the body. The nine Grahas or planets govern this universal body. The 12 Rashis are represented in the Maharishi Jyotish program as 12 equal segments of a circle, each covering 30 degrees.The sequence of the 12 Rashis begins with Mesha as the first Rashi. This illustration shows the sequence of the 12 equal segments of the Rashis, with their Sanskrit and English names, and numbers. 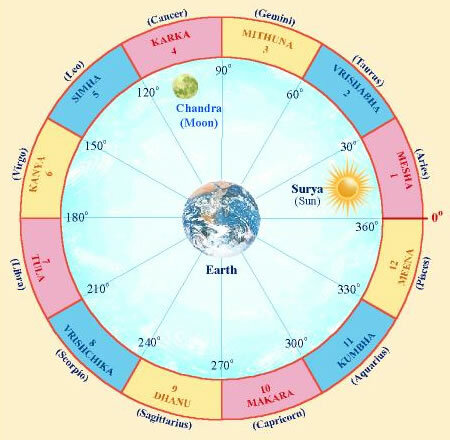 As seen from the earth, the sun moves through the circle of 12 Rashis within the course of one year. It takes the sun about one month to pass through one Rashi. Here, the sun is shown moving through Mesha Rashi or the sign of Aries. The moon is shown moving through Karka Rashi or the sign of Cancer.